French toast bakes are probably the easiest and most impressive make-ahead breakfast that you can serve to guests. 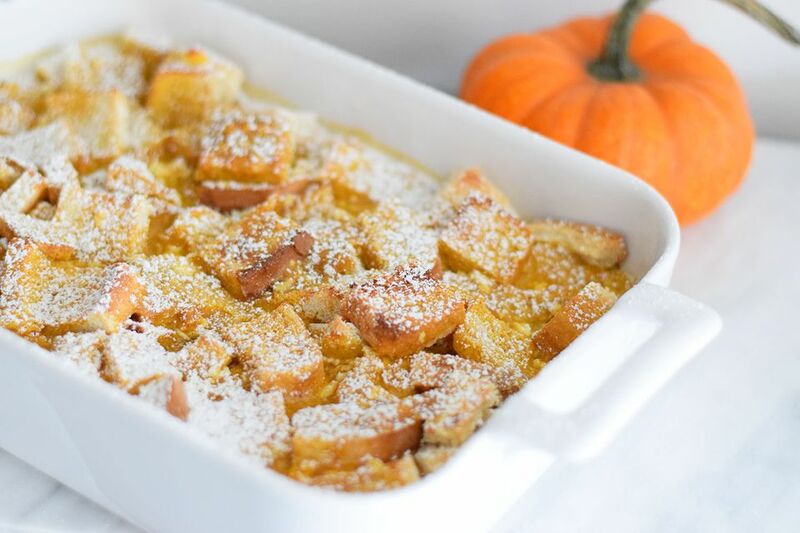 This pumpkin cream cheese french toast bake is the perfect fall french toast. It's creamy, tangy, sweet, spicy, and it's even easier than making a pumpkin coffee cake or pumpkin pancakes. All you need are a bunch of eggs and some day old bread. I like to use white bread that is a few days old and is a bit stale. You don't want the bread to be hard, but the slight staleness will help soak up more of the delicious pumpkin mixture. A nice eggy brioche or Challah add delicious texture and flavor to the french toast. I also like using canned pumpkin puree or pumpkin pie filling. You can use your own homemade pumpkin puree, but it's much easier and has very similar results if you just use the canned. If you need to make this french toast bake in a hurry, you don't really have to refrigerate it. The longer it refrigerates, the more the bread will soak up the delicious pumpkin mixture, but you will still achieve a delicious french toast bake if it doesn't sit for a long time. Just pop it in the oven for the same amount of time and serve with a generous dusting of powdered sugar. Cut the slices of bread into large cubes. Whisk together the pumpkin puree, pie spice, butter, cream cheese, eggs, whole milk, vanilla, and maple syrup. Using a beater works the best in order to achieve a smooth consistency. Butter a rectangular casserole dish. Place the bread cube chunks evenly in the pan. Pour the pumpkin mixture over the bread cubes, until completely coated. Place in the refrigerator overnight or for at least 2 hours. Preheat the oven to 350 F. Bake for 30 to 35 minutes, or until the egg is completely cooked. Sprinkle generously with powdered sugar and serve with extra maple syrup to hungry guests. You can use other kinds of bread instead of the white bread. Brioche and challah work very nicely. A slight staleness works best, you don't want the bread to be hard.